As known, appearance largely determines the hairstyle. Regardless of hair length, you can pick up styling to your taste for each. for example, wavy hair - perfect for romantic natures. Depending on the type and length of hair, as well as the desired shape of the wave is selected way of curling. Make the hair wavy, you can quickly and without special knowledge in the field of hairdressing. The sale represented a huge selection of curlers of various designs, diameters, with various embodiments of fastening on the hair. The softer the right wave, the larger diameter rollers must be chosen. Very popular now enjoy Curler Velcro, which are fixed on the hair without the use of fasteners and other rezinochek. The width of the strand should be less than the width curlers. To get waves in such a way, We need moist (but not wet) braid hair in braids and leave overnight to head such a "haircut" or a hairdryer to dry, depending on the situation. The thinner braids, the smaller will be obtained curls. It should be borne in mind, that the longer hair, subjected to curling, will dry, the longer it will last and then wave. Wet hair should be clean comb fingers, divided into separate strands. On each strand is necessary to apply a little gel for mild fixation, wound on her finger and a few seconds to let. To make the hair wavy manner, head is better to dry without using hair dryer. This is a quick way to curl your hair and get a magnificent styling like Hollywood stars. 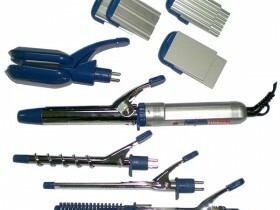 Curling tongs and must be coated with ceramic and the function of the shutter pair. These measures will help to make more gentle heat styling. elementary technology: separated strand, wound on the forceps and for about two minutes, held on them - a lock ready. At the end of all fixed hairspray. However, the, who is weak-dried hair with split ends is better to resort to this method, as little as possible. On damp clean hair along the entire length applied Styling (gel, mousse). Next, the whole volume of the hair is divided into separate strands. Each strand to collect in a fist and highly compressed for a few seconds. Dried everything dry with a diffuser attachment. This method'll get enough to owners of long soft hair. Make wavy hair can be, tightening the strands in the rings and fasten them at the roots of clips or pins. The larger the diameter of the ring, the softer the wave will eventually. As papilotok can use cut strips of cardboard or tissue, which will continue to nakrucheny hair. 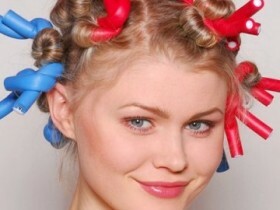 Before you start curling use any styling products: hair it will keep longer teachings form. Drying can be both natural way, and with a hair dryer. For those, who have no time every day to engage in laying, There are a variety of salon treatments: perm., carving and t.d.